For those unfamiliar with the music of Foy Vance, it might seem slightly odd that a singer/songwriter from Northern Ireland would write songs so fully informed by Americana, gospel and blues. But longtime fans will already know that Vance spent much of his youth in the Southern United States as the son of a traveling pastor. These are the folks who will be less surprised to hear the predominant gospel choruses and blues guitar riffs on Vance’s new album ‘The Wild Swan’. Recorded in Nashville with production by Jacquire King (Tom Waits, Norah Jones, James Bay), the songs on ‘The Wild Swan’ never stray far from Vance’s established musical roots, though they do, in the end, give a nod to his Northern Irish heritage as well. Thematically, the album is a pastiche of topics that must weigh on Vance’s mind from time to time, including societal revolution, introspective self-examination, romantic passion, and friendship. On the topic of social progress, Vance opens the album with catchy early single ‘Noam Chomsky is a Soft Revolution’. The title refers to the famed American linguist and philosopher as well as tossing in a laundry list of other pop culture and literary references. Lyrically, this reads a bit like a new millennium version of Billy Joel’s ‘We Didn’t Start the Fire’. But the bluesy guitar and the uptempo, off-kilter rhythms put any further Billy Joel comparisons quickly to rest. The song’s theme of social revolution is mirrored later in the album’s tracklisting by another previously-released track, ‘Ziggy Looked Me in the Eye’. Vance delivers the latter song’s chorus “we’re the children of a revolution / Ziggy looked me in the eye and said a revolution / never let the spirit die, revolution” with the gospel-laced passion of a preacher in the pulpit, but the subtle and thought-provoking lyrics in the bridge section, “you’ll see that all the leaves are falling / and there’s no moisture in the tree / so let’s just light a fire underneath”, make a more dramatic impact. Second track ‘Upbeat Feelgood’ is the simplest and most lighthearted song on the album. But it’s also the one that makes the most lasting impression, its chorus echoing back in your mind hours after listening. The tone is mellow but rhythmically infectious, and the song’s carefree bounce is sure to put a smile on even the most dour puss as Vance impulsively invites, “come and sit down by my side / darling look me in the eye / well, if you want to ask me, now’s the time / my head’s not heavy and my heart is right”. On a more acutely personal note, Foy Vance explores the topic of friendship several times over the course of ‘The Wild Swan’. Touching on it from an unusual perspective is an ode to his friend Courteney Cox’s daughter, titled simply ‘Coco’. While the teenaged daughter of a friend might seem like a questionable muse for a man of Vance’s age, ’Coco’ is a very deliberately artless celebration of child-like innocence and inquisitiveness. It has a sweet James Taylor sort of vibe about it, with a sweetly bemused chorus leading into an unexpected harmonic modulation under the lines “but you know every girl is someone’s daughter / and your daddy must be proud / I’d be proud if you were mine”. Recent single ‘Burden’ is musically smouldering and sensual from its very first notes, so it comes as a bit of a surprise that its lyrics are focused not on romance but on friendship in times of trouble. Its chorus fairly swells with heartfelt reassurance. But Vance saves some of his best lyrics, and probably his most useful advice, for the second verse: “let me carry your burden / when your mouth’s on fire but your mind is cold / and you’re finding flames that won’t keep you warm”. Moving into the realm of romantic love, Vance regales us with a quick-tempo country rock number called ‘Casanova’. It attempts to make light of a lovers’ quarrel. Another slow-burning track is aptly titled ‘She Burns’. In ‘She Burns’, Vance delves into the elusive idea of the feminine mystique, starting with a simple guitar rhythm and opening with the enigmatic lines “she is a little explosion of hope / never turns the lights down low / she can go there if you wanna, though”. Subtly propulsive drums and bass kick in under the second verse, intensifying the very physical sensuality of the song in a way that brought to mind Vance’s cover of Bruce Springsteen’s ‘I’m On Fire’ from a live show in Phoenix last summer. On a more contemplative note, Foy Vance waxes poetic in the heavily gospel-flavoured ‘Bangor Town’, a hymn dedicated to Vance’s Northern Irish home. While his sentiment here is admirable, the structure of the song itself is a bit ambiguous, as if perhaps Vance lost his focus somewhere in middle of his reverie. ‘Be Like You Belong’ is another rather ponderous spiritual number, this one passing along nuggets of rather pastoral wisdom such as “well, there is only now and the future / there’s a truth you don’t hear much, now do ya?” The backing chorus resorts to simple “aahhs” both here and in ‘Unlike Any Other’, though the latter has singalong potential for future live performance. 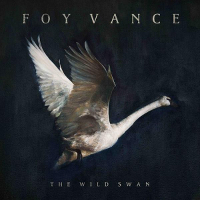 The album’s final two tracks, ‘Fire It Up (The Silver Spear)’ and ‘The Wild Swans on the Lake’ have a more traditionally Irish folk feel, which is somehow unexpected coming from Foy Vance, though perhaps it shouldn’t be. ‘Fire It Up’ centers around a march-like percussion rhythm that somehow evolves into a dance near the song’s ending, where the instrumentation expands to include what sounded to me like bagpipes. Even more traditional in nature, ’The Wild Swans on the Lake’ features a slow and stately harmonic rhythm with wind instruments and barely-there backing vocals creating the visual image of gauzy fog. Presumably inspired by W.B. Yeats’ famous poem ‘The Wild Swans at Coole’, Vance displays his own poetic gifts in delicate and timeless verse lyrics such as “with a crown of daisies on your scented hair, as a bride thee I shall take”. Though ‘The Wild Swan’ contains more than its fair share of these captivating moments, overall, it lacks a cohesive sense of purpose or direction. This, again, is one of Foy Vance’s peculiar idiosyncrasies and probably came as no surprise to those familiar with his earlier music. I must admit that I expected a bit more polish and refinement on this album, perhaps due to its association with Ed Sheeran’s Gingerbread Man Records and Grammy-winning producer Jacquire King. But above all else, Vance remains true to himself on this album, and his brand of authenticity is always well-received. Foy Vance’s ‘The Wild Swan’ is out today on Gingerbread Man Records. Vance will play live dates in the UK and Ireland in support of the album this November and December; you can find all the details here. TGTF’s full collection of coverage on Foy Vance is right here.